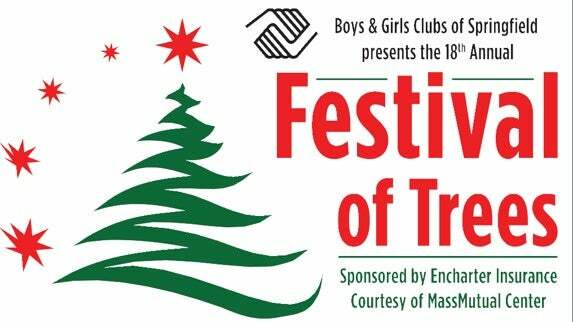 Kicking off immediately following the Parade of Big Balloons outside on Main Street, the Boys & Girls Clubs of Springfield will be opening the Festival of Trees and offering free admission during the Holiday Open House from 11am – 2pm. A stroll through this colorful forest of more than 130 whimsical, beautiful and creative Christmas trees, all donated and decorated by area businesses, organizations, families and individuals, will put you in the holiday spirit for sure, especially when you have the chance to win one! The trees, which are decorated in the theme of the donor’s choice can be valued as high as $3,000, as many of the trees also have gift items that are included. Each tree along with the trimmings and any gifts will be raffled off at the end of the two-week festival. Take your chance to win your favorite tree! Win everything on and under the tree! Tree Raffle tickets are 25 for $10 and can be purchased upon admission. Thanks to your support, the 17th Annual Festival of Trees was a record-breaking year for tree sponsorship, attendance, and revenue! With more than 15,000 visitors and 135 trees, the event raised $170,000! The funds raised allowed the Springfield Boys & Girls Club to provide membership, sport and art based programs, enrichment activities, field trips, and a true “KID” experience for the 2,294 youth served each year by Springfield Boys & Girls Club. The Festival of Trees runs from November 23th through December 9th.